TRIBUTE CONCERT SERIES - Soul Train Greatest Hits will be held at The Pearl，Shanghai from Jan.29 to Jan.30, 2016. Dinner packages available and Booth Reservations for groups. The Pearl and Urban Aphrodite presents the Tribute Concert Series :Soul Train Greatest Hits! 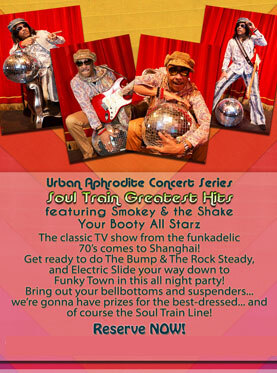 The classic TV Show from the funkadelic 70's comes to Shanghai! Get ready to do The Bump, Rock Steady and Electric Slide your way down to Funky Town in this all night party! Bring out your bellbottoms and suspenders...we're gonna have prizes for the best dressed...and of course the Soul Train Dance Line! Prizes and groovy drink specials all night! Featuring your host, Smokey and The Shake Your Booty All Starz band playing the hits from "I Will Survive" to "Double Dutch Bus"!